I have written before about the Magic Field, which has been generous in its gifts of interesting arthropods. Among the most common of these are Orthopterans, like grasshoppers and katydids, and the solitary wasps that hunt them. 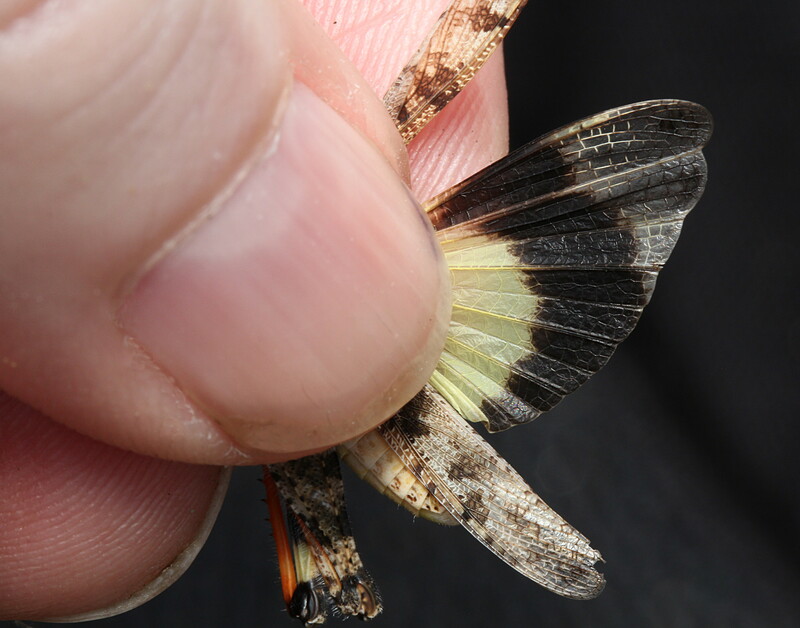 The Magic Field has no less than five different species of band-winged grasshoppers, which are grasshoppers that flash brightly colorful hind wings when in flight. Never have I seen such diversity in one area from this particular group. Here are four of those species. The fifth has rather pale hind wings and I have not gotten around to photographing it. 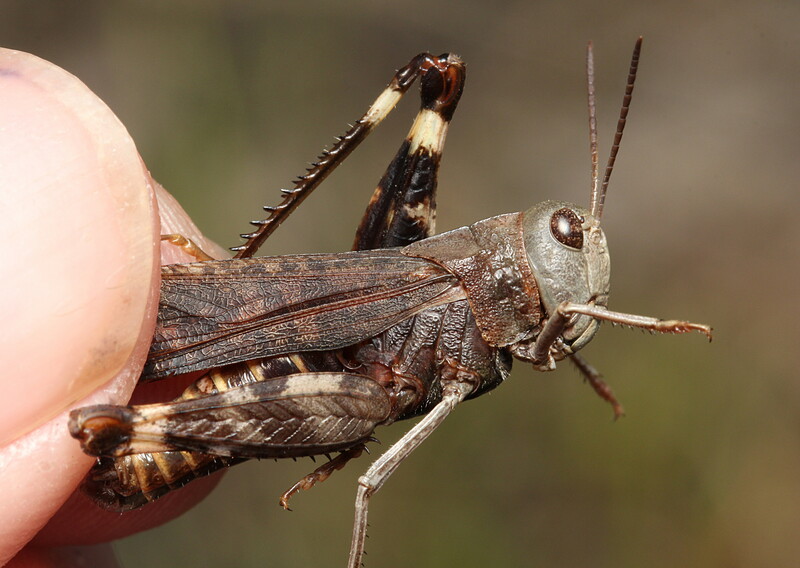 In the first two pictures we meet the Carolina grasshopper (Dissosteira carolina), a species that is probably very familiar to those in the U.S. It is recommended that readers click to enlarge the first picture to closely view this insect. One then discovers, with pleasure, that even a mundane grasshopper is startlingly complex in its colors and textures. Like the other pictures that follow, the second picture shows the only way that I know to display the colorful hind wings. 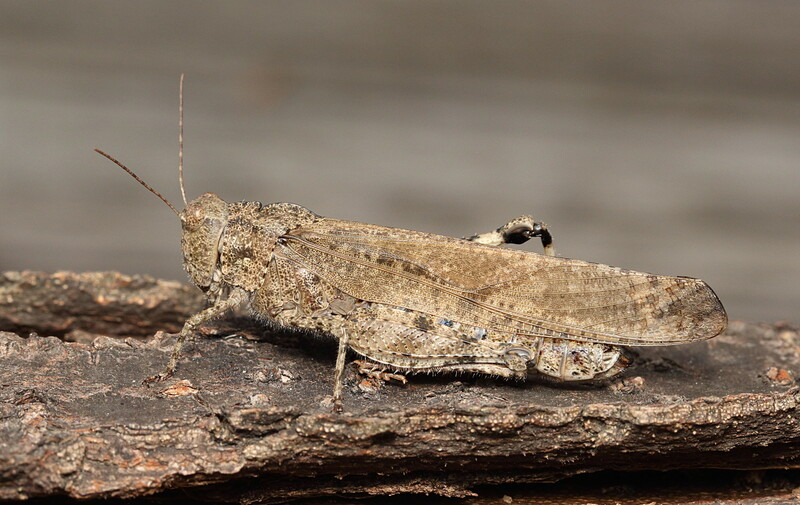 The next two pictures are of the mottled sand grasshopper (Spharagemon collare), which, as its name implies, is very hard to see even when one knows exactly where they have landed. Following this is another small species of ‘hopper that is pretty exciting when first seen in the field. This darkly colored insect has orange or sometimes red hind wings, and for this it is called is the red-winged grasshopper (Arphia pseudonietana). 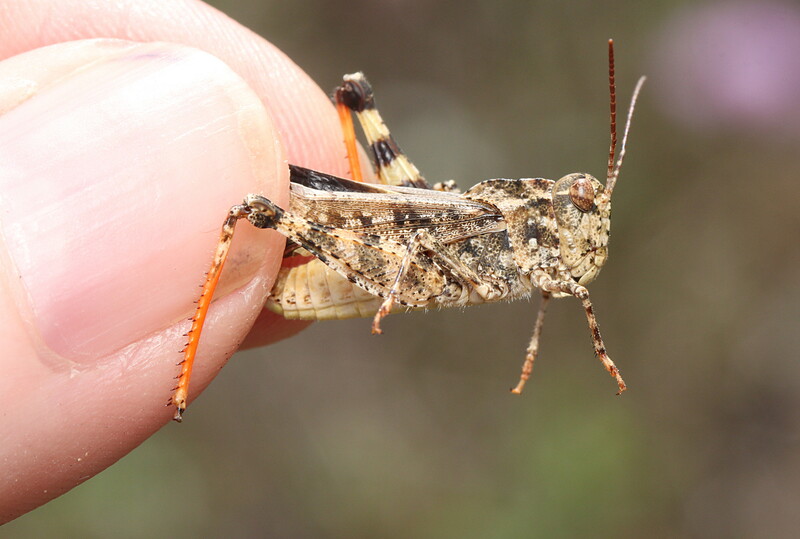 This one is one of the wiliest grasshoppers! Very hard to catch with the net since they are very good at quietly sneaking out from under it. While pacing the field to scare up ‘hoppers, the real thrill comes when a big coral-winged grasshopper (Pardalophora apiculata) is flushed. This is a large and robust species, and one especially notices that when a female takes flight as they are positively ponderous in the air. But they are beautiful, as one can see. The amount of green in their body color is variable. I really like the look of them, and their hefty appearance somehow conveys that this is a grasshopper that Means Business. When I visit the Magic Field in the early spring I will see adult coral-wings. This is because they overwinter as late-instar nymphs. 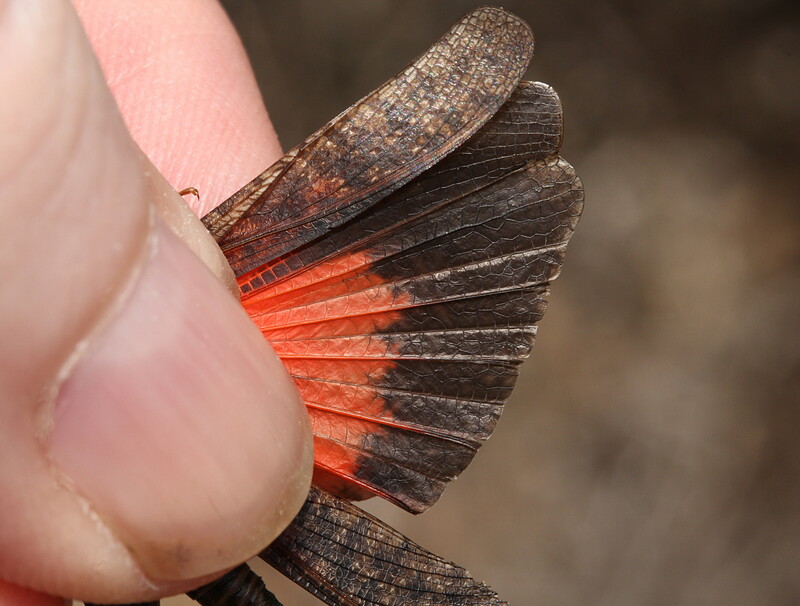 Why have brightly colored hind wings? 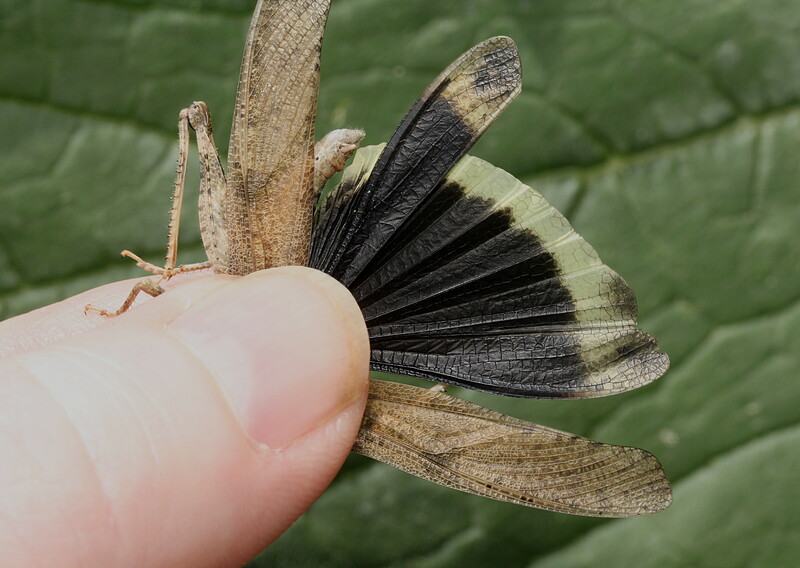 Band-winged grasshoppers are well camouflaged when at rest, but it is believed that when in flight their flashing hind wings serves as a kind of deception to predators. In flight they are signaling “look at me, I’m orange!” or “I’m yellow! !” Then they land, fold their wings, and virtually disappear. A pursuing predator would have developed a ‘search image’ for something orange or yellow, and so will not be looking for something that looks like a mottled twig. They sometimes will add to this trickery by landing and quickly scooching over a few inches so they are not sitting where they most definitely landed. All of this makes the task of catching them extra challenging. But they are to be admired for that. It should be emphasized that no grasshoppers were harmed in the taking of these pictures. At the peak of summer the Magic Field hosts thousands of small flowering plants called spotted beebalm (Monarda punctata). This odd little plant is like catnip to two of our larger wasps, the great black wasp (Sphex pensylvanicus) and the closely related golden digger wasp (Sphex ichneumoneus). Both kinds of wasps concentrate heavily on these flowers before turning their attention to hunting katydids and sometimes grasshoppers. Their prey is paralyzed and stored in a burrow with an egg. The larva of course will eat the helpless prey. 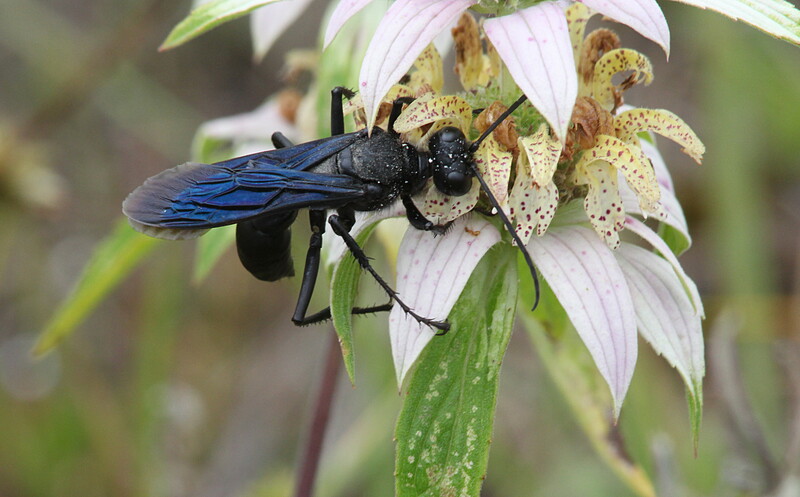 The next picture shows a great black wasp on beebalm. 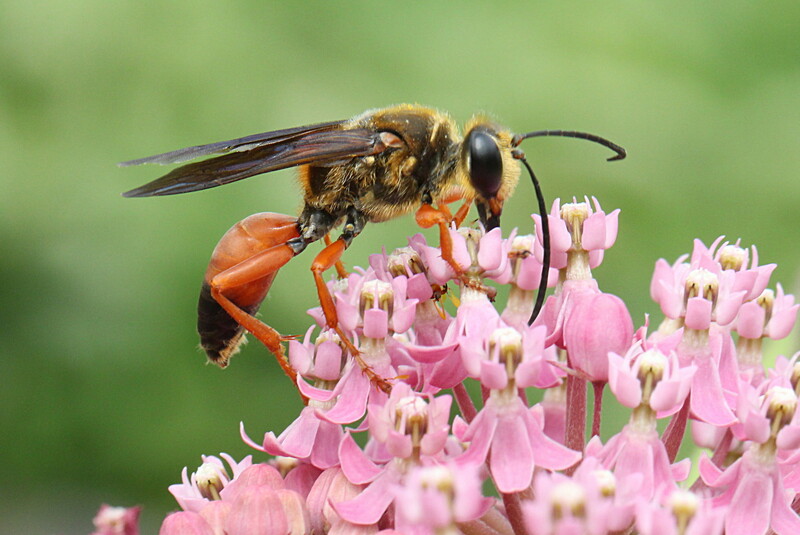 The last picture is a golden digger wasp. The latter species tends to become heavily covered in beebalm pollen and so I chose to show one on milkweed instead. This entry was written by whyevolutionistrue and posted on July 16, 2018 at 7:30 am and filed under insects, insects and other arthropods, plants. Bookmark the permalink. Follow any comments here with the RSS feed for this post. Both comments and trackbacks are currently closed. 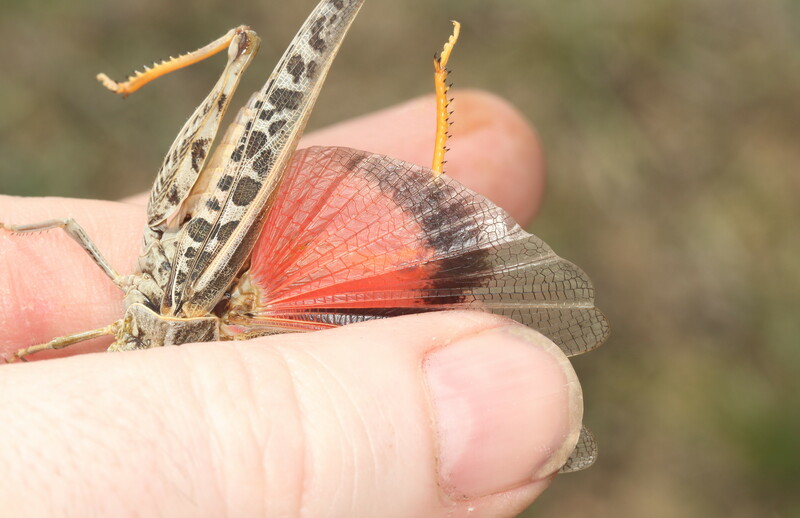 Wonderful pictures> I grew up in the midwest and never noticed those red-winged grasshoppers. Amazing diversity! Thank you. The logic of the colored wings for confusing predators is great. Great photos and very informative. Thanks!! That is a terrific post. Thank you! I had no idea their wings were to chromatically complex. Very nice. But — but — that pink flower is a milkweed (Asclepias)! I likely reversed the pictures from the commentary. The black wasp is on bee balm, and of course the golden digger is on milkweed – I chose showing it there b/c they get well covered in bee balm pollen. Lovely photographs! Makes the seemingly mundane grasshoppers seem special. thanks for these, just great. Wonderful photos! So fascinating to expand them and study them in detail!